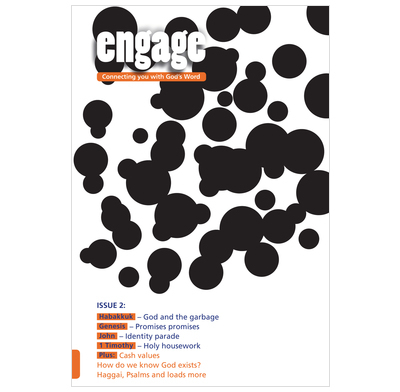 Issue 2 of Engage looks at Habakkuk, Genesis, John, Psalms, Haggai and 1 Timothy. Issue 2 of Engage - daily Bible reading notes for teenagers. This issue looks at Genesis, John, Haggai, 1 Timothy, Psalms and Habakkuk! It also examines questions like 'how do we know God exists? ', 'what's the point?' and contains articles on God as dad and cash values. Tricky: How do we know God exists? Tool box: What's the point? This is the most engaging (!) series of devotions for teens I ve run across. And I ve been looking for many years. Allows teens to hold the book and Bible in their own hands and the thoughts are not insulting or trivializing. Deserves widest possible circulation.